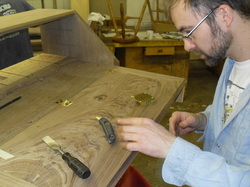 For several decades Matt has continued to grow as a master craftsman. Matt grew up in Perquimans County, North Carolina (northeastern NC) and from an early age his father, master craftsman Ben Hobbs, passed on his skills, work ethic, and passion for traditional American furniture. After studying engineering, Matt spent two years as a Graduate Fellow at the premier collection of American decorative arts, Winterthur Museum, studying that collection and getting to know the culture and craftsmen that created the masterpieces within. His thesis research there focused on the complexity of the economy in rural northeastern NC, justifying the vibrant and sophisticated furniture trade the region enjoyed, particularly that of Thomas White in Perquimans. 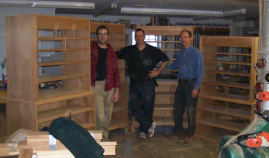 Matt launched his own shop in 1999 alongside of his father where he had the great joy of collaborating on many projects and teaching in Ben's furniture-making classes. Since moving to Durham NC in 2002 Matt has maintained a full production shop in Durham NC and continues to offer clients the same level of attention and craftsmanship. Matt serves on the advisory board of the Museum of Early Southern Decorative Arts in Winston-Salem NC and is a member of the Society of American Period Furniture Makers. Matt is beginning to pass on his trade to his son, Winslow, and daughter, Penelope.